Geez! Is this the future we want? Also, if we don’t call this exponential change, I don’t know what that expression means then! The new anchors at China’s state-run news agency have perfect hair and no pulse. 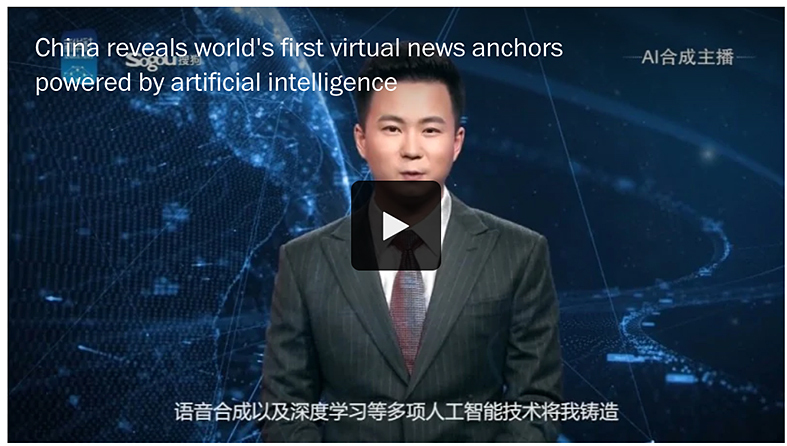 Xinhua News just unveiled what it is calling the world’s first news anchors powered by artificial intelligence, at the World Internet Conference on Wednesday in China’s Zhejiang province. From the outside, they are almost indistinguishable from their human counterparts, crisp-suited and even-keeled. Although Xinhua says the anchors have the “voice, facial expressions and actions of a real person,” the robotic anchors relay whatever text is fed to them in stilted speech that sounds less human than Siri or Alexa. The question is…is this what we want our future to look like? Personally, I don’t care to watch a robotic newscaster giving me the latest “death and dying report.” It comes off bad enough — callous enough — from human beings backed up by TV networks/stations that have agendas of their own; let alone from a robot run by AI.